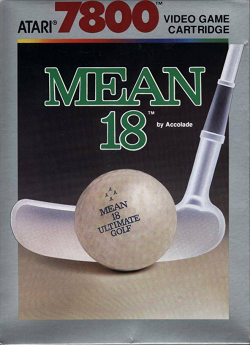 In this review, we hit the links in the Atari 7800 game Mean 18 Ultimate Golf. We find out how well this golf game plays. This game was released in 1989. It is a port from other systems. You can choose between beginner and expert (the difference being how big the draw or fade is) and the type of tees. After you select your difficulty, you are then placed on Pebble beach – the only course in the game. You can select the golf club with up or down. After this, you can aim left or right. From here, you utilize the power meter. Tapping once will initiate the swing. The second button press determines the power of the swing. The higher up the meter, the more powerful of a stroke. After this, the indicator will go back down. The third and final tap will determine the accuracy of the stroke. To get a perfect swing, you have to hit the line right before the dark green area. Anything going either direction will get you a draw or fade. One really helpful feature is the distance indicator. This number will likely prove to be the most useful in determining distance. Once you get a good handle on the distance value, it’ll gradually become easier and easier to figure out what kind of power you need to utilize in your swing. You get to play all 18 holes. After each hole, you get to see the progress of your score. At the end, you get a final total before being put onto the intro screen again. Having played a lot of sub-par Atari 7800 games, I honestly started wondering if there is any game that is praise-worthy games on the system. I may have finally found it with this game. The learning curve is pretty decent. The length is pretty solid. The difficulty is about right. Really, there are a lot of positives to be had in this game. Another interesting feature is the hills on the green. The darker “L”s point to the direction of the hill down (think of them as arrows). While a little bit funky, it’s possible to figure this out with minimal trial and error. This game isn’t without its flaws. One flaw is the fact that you can only play on the one course. It would have been great to see a second or maybe even third course, but in all honesty, you can get some great enjoyment out of the single course anyway. Another flaw is the fact that the game can’t really tell ball height in relation to trees. In one shot, I landed the ball just in front of a tree. The ball bounced a couple times, but then the game made a sound of me hitting the tree even though the ball was on the ground. In actuality, I think the ball was in front of the tree, but it detected a hit once the ball overlapped a branch. This isn’t a huge glitch, but it is a flaw nevertheless. In spite of the flaws, this is still a great game. It has a good learning curve, the difficulty is about right, and the small features work very well. Graphically speaking, this is both a major strength and a bit of a weakness for this game. The strength is the fact that it’s great to see a third person perspective on the course like that. At the time of release, not a whole lot of games gets this right. This game does a reasonably good job at doing so. The golfer is nicely rendered (both on the tee and on the green). A setback is the fact that it’s very hard to tell distance with the graphics. The depth perception is a little warped – especially at closer distances. Still, I’d say that’s the only thing holding this game back graphics-wise. The effects of the ball going into the water works very well. There isn’t any music in this game. The fact that this is a golf game may have saved the audio a little. The sound effects are able to tell you a lot of information. The sound of the ball hitting the trees, landing on the grass, going into the rough, hitting a sand trap, slipping into the water, and even going out of bounds have their own sounds. The stroke sound also works very well. So, the sound ends up being half way decent. Overall, this is a great game to play. The difficulty is about right. The difficulty options are a nice touch. The learning curve is pretty good. The distance indicator is a real life savor. The swing mechanics work very well (something I’ve seen in later games even). The trees may be a little buggy and there may be only one course, but the length is still pretty solid. The graphics are nicely realized. The third person perspective is certainly impressive. They aren’t perfect as there is really no sense of depth perception. Still, great nevertheless. The audio is OK. Finally, a great game on the Atari 7800. Furthest point in game. Completed 18 holes. Out: 89.